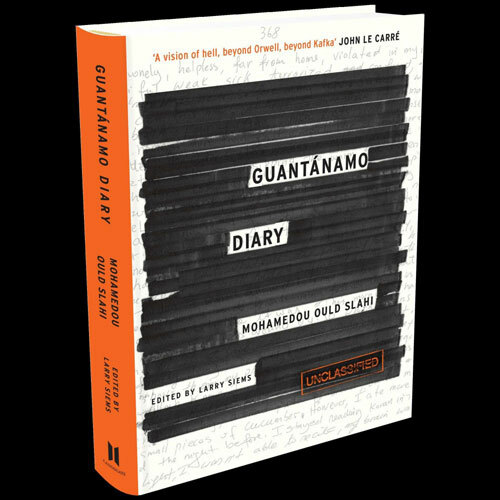 The joke is that Mohamedou, now 46, is perhaps the most identifiable Guantánamo prisoner, the author of the riveting, bestselling memoir Guantánamo Diary. His words have been translated into some 27 languages and read worldwide since the book’s release in January 2015 (after his lawyers' eight-year fight with the US government to have the text released). They are words of candor, humor and unvarnished horror as he trains a true writer’s eye on what he calls his “endless world tour” of interrogation and torture at the behest of the US Government, an extralegal exercise spanning six countries and nearly 16 years in full, during which his captors failed to come up with a single crime to charge him with. After a final battery of medical checks and biometrics capture that final day at Guantánamo, Mohamedou was ferried across the actual Guantánamo Bay to the base airport and loaded onto a military transport he’d have, apart from the guards, all to himself. The US government flew him home to Mauritania just as they’d brought him to Guantánamo – in shackles, black-out goggles, a noise-canceling headset and extreme discomfort. He landed ready to work. I had the privilege of spending the third week of November, just a month after his release, sitting with Mohamedou in his freshly-painted office in central Nouakchott, Mauritania’s sandy capital, working intensively together on my adaptation of Guantánamo Diary for a feature film. I found Mohamedou acclimating to life out of prison with stunning resilience and humor, even as he’s open about the good bit of mending he has still left to do. He is surrounded by a devoted and protective phalanx of siblings and nephews who, among other things, shield him from the overwhelming attention he's received since his return as Mauritania's biggest celebrity; as many as one hundred visitors a day passed through the gates of his family's modest compound in the first weeks after his return. Michael Bronner: You and I have been talking about the book all week, but I wanted to delve a little deeper into one aspect I found particularly fascinating, which is your attention to questions of sovereignty and the history of colonialism insofar as they color what you call your “endless world tour." It seems this historical perspective was an important part of the book for you. Mohamedou Ould Slahi: Yes, of course. This is all about the traditional colonial powers (the United States, of course, is a present colonial power). Back in the day, the colonies were the land of “open season” for them: What you couldn’t do in France, you could do in Algeria, [or] you could do in Mauritania. The colony was a place where you could take off your clothes, so to speak, and do whatever you would like without fearing any laws, because you could always say, “Those people are savages, they don’t understand – those countries are different.” So this is the key to my whole story in the present day. Very powerful countries gave a very bad example to developing countries [in terms of my arrest]. The message was clear: Those countries – those weak countries, the developing countries - are a playing field for us to experiment with things we cannot do at home. For instance, Mohamedou Ould Slahi could not be arrested within the existing laws, rules and regulations in three very advanced countries: In Germany, in Canada and the United States, I didn't break any laws. Of these three, only the United States was interested in capturing me, but they needed a place outside those jurisdictions – a kind of a jungle – and they lured me [home] through my family. My family naively accepted the lure. They got me to Mauritania, where the United States stripped me of all my rights. And then they did the rest of the story as you know it. MB: You were living in Germany, then Canada. Tell me a little bit about the trick the US used to get you to Mauritania. MOS: Well, first they tried with Germany, but Germany was a “no-go”: Germany said we cannot even interview him because he did not do anything remotely suspicious. MB: The Germans refused to interrogate you? MB: You were last free in Canada – this is in January 2000 – and you got a call from your family saying that your mother was very sick? MOS: Very sick. Yes. And she wasn’t sick. That was the bait. I passed through Belgium [changing planes]. They did not arrest me in Belgium. MB: Just to be clear, why did your family call and tell you your mother was sick? They told you she was dying. MOS: Yes. Later on, they told me the [Mauritanian] government came to them and said, “Your son is in big trouble, and we can't help him [if he's abroad]. We don't want America to arrest him. We want him to come here, to stay with his family, and we’ll protect him in Mauritania.” So they told them the exact opposite of what would happen to me. MOS: Deddahi – the man that you interviewed [I spoke with Mauritania's former secret police chief, Deddahi Ould Abdallahi, about his role in Mohamedou's capture and rendition while I was in Nouakchott]. Deddahi invited my oldest brother to his office and he told him the plan [to lure me home for my own protection]. My oldest brother one hundred percent took the bait. He fell for it. My sister called me, and her tone was very serious: She said, “Your mother is very sick.” I was afraid my mom was going to die, and that, for me, was it. I had to go, no matter what happened to me. Some Canadian friends [who knew about my previous interview with Canadian authorities] told me, “Slahi, you will be arrested. We’ve seen it before. The United States wants you, not Canada. If you go to a place where there is no rule of law, they will arrest you." And this is what happened. Mohamedou was arrested just outside the airport in Dakar, Senegal, on Jan. 22, 2000, after flying from Montreal, via Brussels, en route home to Mauritania. His brothers, who had driven from Nouakchott to pick him up for the 300-mile drive back home, were also briefly arrested and released. Mohamedou's interrogations in Dakar, undertaken by Senegalese intelligence at the behest of the United States, centered around the Millennium Plot in which an Algerian-born Canadian named Ahmed Ressam, who Mohamedou did not know, attempted to cross into the United States with explosives to bomb Los Angeles International Airport. Mohamedou's interrogations in Dakar were observed by American agents. MOS: In Dakar, the United States was in full control of me. This is very surreal. Canada is the closest ally to the United States of America, but America released control inside Canada because of the rule of law that chains Canadian law enforcement. But as soon as I got to what we call the former colonies, that is where the United States took control. MB: One of the most interesting scenes in the book is when you're about to be flown from Senegal to Mauritania. There was a "white guy" present, whom you imply is American. As you write: Everybody seemed to be prepared in the airport. In front of the group the interrogator and the white guy kept flashing their magic badges, taking everybody with them. You could clearly tell that the country had no sovereignty. This was still colonialism in its ugliest face. So even passing through airports, the Americans were in control? MOS: Yes. Of course, I don’t know the [white] guy. He didn’t speak a word. He was a white-looking Westerner. I have no proof that he was American, but I have proof that he was leading the group. He was leading the highest authority in the country, which is State Security. There is no higher authority in Senegal. Technically, State Security is under the umbrella of the Interior Ministry, but that is only an umbrella. They are completely independent. MB: That kind of perspective – a sophisticated perspective of how the world is ordered, still in the legacy of colonialism – is frequently voiced within the Islamic movement, which draws attention to some of these anti-colonial themes in its rhetoric. How did you come to this perspective? MOS: I read history a lot, and I am very well versed in the rhetoric of what you call here, loosely, the Islamic Movement. The Islamic Movement is a ragtag of people who are proud of their culture or country, and [other] people who say, “It’s my duty to kill anyone who is not like me, doesn't look like me or believe like me.” And it also includes those nationalists who believe in what we call Pan Arabism. So it’s a very wide spectrum. They have one thing in common: They don’t like colonialism, and they know that colonialism is part of a very ugly past. What the colonial people did in Africa is horrifying...I’ve seen the other side. I lived my whole adult life in Germany, and I like democracy. I like the rule of law. America says the rule of law is good, democracy is good, but in practice they say democracy is not good in Africa. Africa is their place to break the rules. That really pisses me off, because I don’t want the rule of law to be broken in my country. I want my country to be like Germany. To be like the United States of America. I want to have dignity. I want my people to have dignity. And I’m still living this today: [The United States] released me to Mauritania, but made sure Mauritania is now just a bigger prison for me. I cannot leave Mauritania. Why? No one is telling me. Did I break some laws? No! This was all done in secret. MB: A secret deal between the United States and Mauritania as a condition of your release. MOS: An open secret, because during my PRB [Periodic Review Board, the body at Guantánamo that considers prisoners for release], one of the issues they said they had a problem with in terms of me being released was if the Mauritanian government did not restrict my travel. They said they were afraid I might travel to Germany and seek to live there. That’s a crime? That’s a reason why I should not be released? I’m a positive person, and I tell you this for the record: I will have my passport much sooner than you think, because I know I’m a good person. I know I love peace. I know that I am a plus to the world. I’m not seeking to harm anyone. For those reasons, I know I will have my passport. But I want a better world. I want a world where the United States of America is an example for the rule of law, because America has that responsibility. Just like in Spider Man [laughs]. When his grandmother said, “With power comes responsibility.” Something like that. So I say to the United States of America: Please watch Spider Man! Look, America should be an example to countries like Mauritania and Senegal and tell them it works when you follow the law, but what they’re saying is that it doesn't work. We tried it in the US, and it doesn't work. MB: Its one of the biggest debates right now in the United States - whether or not the rule of law is enough to protect the world’s most powerful country, or whether the rule of law is great until you feel threatened, and then its not strong enough. That's been the question underscoring the debate over Guantánamo, which was designed to exist outside the rule of law. MOS: This is the philosophical debate. I don’t have an answer as to whether the rule of law is good enough to protect people. But what do we want? The most vulnerable among us want the rule of law. So are we going to tell them "no"? Who decides that you are dangerous enough not to apply the rule of law? If the government decides it, then you can say goodbye to the whole human endeavor, mostly by the Western peoples, to develop themselves and become the greatest nations on earth, and we can revert back to the Dark Ages where the king decides. The king now decides in the United States. The President of the United States decides – he signs a paper that says, “Kill that man.” Why? “Because he’s bad.” Who says he’s bad? “I say he’s bad.” That’s what kings did. I’m not saying this is right or wrong. No, I’m saying this poses a problem we have to solve: You and I and other people have to solve this problem. But I’d be very upset if we cannot have rules that I can respect and say, “I have no fear because I respect the law.” If there are no rules, I have no rules to respect. I don’t know whether or not I’m committing a crime. MB: So we should all watch Spider Man. *For my conversation with Deddahi Ould Abdallahi, the former director of Mauritania’s State Security service who, in 2000, conspired with the United States to lure Mohamedou back to Mauritania and arrest him, see The Guantánamo Diarist's Hometown Tormentor.